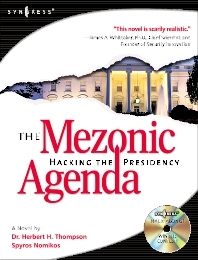 The Mezonic Agenda deals with some of the most pressing topics in technology and computer security today including: reverse engineering, cryptography, buffer overflows, and steganography. The book tells the tale of criminal hackers attempting to compromise the results of a presidential election for their own gain. The accompanying CD contains real, working versions of all the applications described in the fictional narrative of the book. Computer users, programmers, IT professionals, and policy makers need to be made aware of the risks involved with deploying new technologies and see how attackers can leverage these technologies for their own purposes. While the story in The Mezonic Agenda is fictional, the technologies, exploits, and hacking techniques are all very real. The first cyber-thriller" that allows the reader to "hack along" using the accompanying CD which contains working versions of all the applications described in the book. To be published in October 2004 when interest in the American Presidential election will be at its highest. Provides IT professionals with the most advanced, timely, and accurate information available on security exploits in a fascinating, fictional narrative. Computer users, programmers, IT professionals.